This book provides thorough guidance on various forms of data generation and analysis, presenting a model for the research process in which detailed data analysis and generalization through the development of concepts are central. 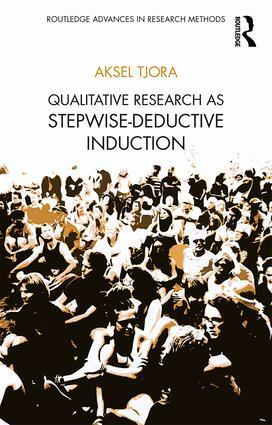 Based on an inductive principle, which begins with raw data and moves towards concepts or theories through incremental deductive feedback loops, the ‘stepwise-deductive induction’ approach advanced by the author focuses on the analysis phase in research. Concentrating on creativity, structuring of analytical work, and collaborative development of generic knowledge, it seeks to enable researchers to extend their insight of a subject area without having personally to study all the data generated throughout a project. A constructive alternative to Grounded Theory, the approach advanced here is centred on qualitative research that aims at developing concepts, models, or theories on basis of a gradual paradigm to reduce complexity. As such, it will appeal to scholars and students across the social sciences with interests in methods and the analysis of qualitative data of various kinds. "This book offers a refreshing and reinvigorating take on qualitative research as a creative and adaptive exercise rather than a formulaic activity. Tjora’s approach challenges many of the entrenched practices and assumptions of contemporary qualitative research practice, and in line with his previous work, his approach is to challenge the status quo, as well as offer a realist, in-depth and usable approach to qualitative practice. This book is insightful, nuanced but pragmatic and practical, and will thus resonate across academic levels (students to academics) and a wide range of academic disciplines interested in best practice in qualitative enquiry." Alex Broom, University of New South Wales, Sydney, Australia. "A highly insightful introduction to qualitative research that addresses the challenges of data generation and analysis and powerfully demonstrates the importance of curiosity, creativity and methodological flexibility in undertaking interpretative research." Christian Heath, King’s College London, UK. "A corrective to the misunderstood nature of Grounded Theory, Tjora offers novel ideas on how to generate superior qualitative data. In addition, the book can be used as a primer for novice researchers to learn about observations, interviews, documents, and analysis/coding." Peter Adler, University of Denver (Emeritus), USA. Aksel Tjora is Professor in the Department of Sociology and Political Science at the Norwegian University of Science and Technology (NTNU). His current research is on social interaction and communal processes in relation to organizations, culture, public space, and communication technologies.